Quirky Jessi: Adopt a Turkey--And That Does Not Mean Eat It! Adopt a Turkey--And That Does Not Mean Eat It! As promised, I told you I'd tell you about the adopt-a-turkey program I discovered. I'd never heard of such a thing, so I couldn't help but giggle at it. 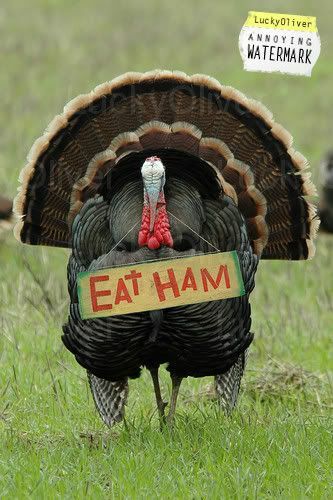 I mean, it's Thanksgiving time--most aren't thinking about selecting the perfect turkey to feed and love. They're thinking about eating it. Read more about it on her site and let me know if you decide to adopt! pc or not, i love that "eat more ham" sign! I would only want to adopt a baby. The older ones are too surly and have abandonment issues.